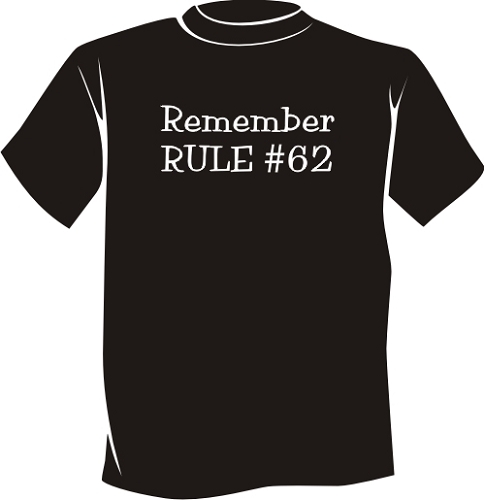 Recovery Swag | Rule #62 | Fun and Funny T Shirts for anyone in recovery! Rule 62, "Don't take yourself too damn seriously," is found on Page 149 of the book Twelve Steps and Twelve Traditions published by Alcoholics Anonymous World Services, Inc. In discussing Tradition Four - "Each group should be autonomous except in matters affecting other groups or A.A. as a whole" - Bill W.'s essay spoke of an example where a group had grandiose ideas, partly because an enthusiastic promoter got them all excited about building "a great big alcoholic center" using other people's money. The deal went sour and the experience became a lesson in humility.